Japan’s GPIF lost a staggering $136 billion due to Q4’s rout in equities. As 2018’s fourth quarter shockwaves jolted investors worldwide, Japan’s Government Pension Fund Global (GPIF) was no exception, losing 9.06% of its assets, or $136 billion, in just three months. The world’s biggest pension fund released materials showing the fund’s total assets fell from its record 165 trillion yen in September to December’s 150 trillion yen, its worst slippage since April 2008. The plan was down 4.31% for the fiscal year. Foreign and domestic equities, which accounted for nearly half of the pension giant’s assets under management, supplied the most damage, declining 15.71% and 17.57%, respectively, in the quarter. For the fiscal year so far, which ends in March, they dropped 5.08% and 11.82%, respectively. The fund’s benchmarks for the asset classes, the TOPIX and MSCI ACWI indexes, were down 15.58% and 17.60% in the quarter. For the fiscal year ending in March, they lost 4.88% and 11.86%. The slide included the fund’s foreign bonds holdings, although the results were less bloody. That asset class took a 2.74% hit for the quarter, and only lost 0.45% over the current fiscal year. Foreign bonds were 17.41% of the Japanese pension fund’s portfolio. The FTSE World Government Bond index lost 2.49% in the quarter, and shrank 0.38% in the fiscal year. Domestic bonds, which were 28.20% of the fund’s portfolio, was the outlier with positive results, returning 1.01% for the quarter, and 0.36% in the fiscal year. The composite benchmark was up 1.02% for the quarter, and 0.35% in the plan’s current fiscal year. 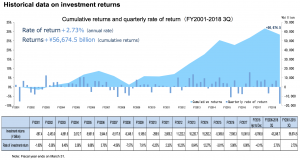 Short-term assets, the remaining 6.38% of the Japanese fund’s portfolio, were flat.